The story opens in 1902 in Peterborough, Ontario. Bertha MacLean is recovering from an attempted suicide, while her husband Paul assures their two sons that this was an accident. Paul later confides in the doctor that this has occurred before. Bertha yearns for love and attention while harboring angry memories of her father's desertion. Servants maintain the household in Canada, but the long winter has depressed Bertha. She needs a new interest, and china-painting becomes her obsession. As she paints, she reminisces about city life in Chicago, about her mother's boarding house and how she met Paul. She tries not to think about her impending twenty-seventh birthday, especially because she fears she is pregnant. Her sons are nine and ten, and they are enough for her to manage. She paints and watches her waistline expanding. The baby girl, named for her, is immediately an annoyance to Bertha. Paul is captivated by the baby who looks like him. Bertha's jealousy becomes evident, although Paul reassures her with gifts and his love. When Paul is transferred to Illinois, the family temporarily moves into Grandma's boarding house in Chicago. The boys enjoy stories of the World's Fair of 1893. Bertha and Paul find a home in Ferris Valley, a small town fifty miles from the city. Life in a small town provides the setting for weddings, gossip, periods of wartime, church services, family meals and sibling rivalry. Just when Bertha settles into the routine of children in school, the church sewing group, and tea with her neighbor Betty, an artist comes to her door, selling paintings. He is one of her mother's boarders, selling his work in the country. Their acquaintance sparks a flirtation that adds spice to Bertha's life. As long as she is in control, Bertha is comfortable. But a spiral of events leads to some scenes of temptation and possible discovery, a threat to her security. As the young Bertha grows up, she and her mother tangle repeatedly. Paul remains the steadying influence in raising the children. Bertha begins to manipulate people, scheming about ways to control her maturing children and their futures. Paul accuses Bertha of adjusting the truth to suit herself. Some of her most extravagant outbursts of temper result in cutting up her daughter's prom dress, having young Bertha's graduation brooch cut up into three rings for her nieces, and finally disowning young Bertha when she marries the man she loves. There are heart-breaking scenes mixed in with some gentle, touching times. Bertha manages to stir emotions wherever she goes. Paul, thirteen years her senior, retires and shows signs of senility. Young Bertha has a baby girl, and Bertha exerts the power to have her named Bertha. The sons despair over their mother's behavior, but in spite of Bertha, they live productive lives. As a widow, Bertha's obsession becomes her will, as she moves people in and out of it over the next thirty years. Paul had wisely set up a trust which she cannot control. At her death, only three grandchildren survive to see the cunning plan she had worked out. Her lawyer calls the will "unique." 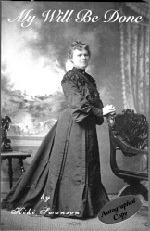 A footnote from the author:	With today's understanding of psychology, Bertha would be a classic case of an adjustment disorder, a maladaptive reaction to a stressor or to a physical disturbance, shown in excessive outbursts and aggressive impulses, with no memory of the scenes and no regrets. Her discontent with life was a product of an unhappy home life as a child and an inability to accept herself. With a third grade education, she became the wife of a corporate executive and could never even find comfort in all God's blessings.